The skill Alchemy in the game Skyrim allows you to make useful potions and poisons. The player can create a unique tinctures, which have different from ordinary potions properties. 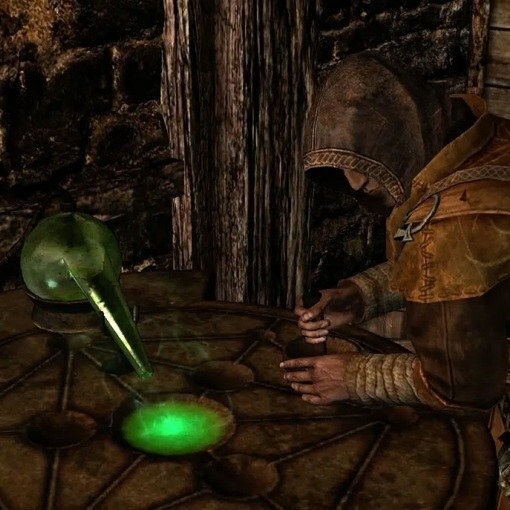 In addition to earnings from their sale, potions have value for some storyline quests, revealing to the player a new ability to interact with characters in the world of Skyrim. For leveling Alchemy skill in Skyrim, go to Whiterun location. Then look for the house of one of the characters in the game, alchemist Arcadia. Talk to her and get permission to use the alchemical laboratory. Then buy or steal she has an emerald ring that increases the skill Alchemy. Grab this object, and then use the lab and start cooking a potion. In the manufacture give him a property that increases skill Recovery. When it is ready, unequip all of your characters items that give a bonus to skill Alchemy, and drink the potion. Now put back the items giving a bonus to Alchemy, including the ring, which began to give more bonuses than before. Again begin brewing the same potion. Remove all the items, drink the potion and put back an emerald ring, which became even more powerful. Repeat procedure until then while this ring will not give a bonus that increases your Alchemy skill to the desired value. Another method of leveling the skill is to find as many ingredients or buy them from merchants in Whiterun locations. After that, use the alchemy lab and make as many potions as you can, thereby increasing the skill Alchemy. The finished potion is sold, and the money to buy new ingredients, and again engaged in the manufacture of potions. Repeat these steps to raise the necessary skill. A slow but steady way to level alchemy is to gather and investigate the properties of the ingredients. Along the way, collect all the plants and meat of animals and fish that can be eaten. Eat them, and your character will be aware of all the properties of this ingredient that will raise the Alchemy skill. To pump the skill Alchemy can also use the code. Press the tilde ("~") and the console. In the opened window, type: advskill Alchemy and specify the number to which you want to pump the skill. The ability of your character to alchemy will increase dramatically.